Know what to wear to work and what are the clothes, Fall Winter 2015-2016 fashion trends, you have to re-enter or purchase for your wardrobe. Know the Fall 2015 Fashion Essentials, for the colder days of the season. 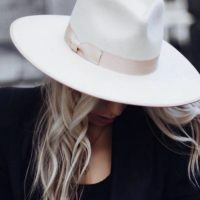 These are statement pieces, ie, interesting and attractive wardrobe items, which reflect the personality of those who use them, and also how to use each one. Fall Winter 2015-2016 hairstyle trends, are highlighted either by texture or performance, and use up loose and tied, long or short. The inspirations of Fall Winter 2015 range from retro, glamour, the minimalist tie, the tousled ponytail, through the tousled short and medium bob, to bangs. 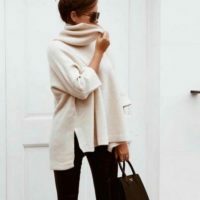 Know how to dress to look thinner, by choosing the clothes that work to your advantage and value you, feeling even more beautiful, charming and elegant. After Summer break comes back to work, and with it, the black and white fashion trend fall winter 2015-2016, a timeless classic, returns to join this season with delicate and feminine details Chunky Quilted-Knit Long Cape, Long-Sleeve Ruffle-Front Blouse & High-Waist Skinny-Leg Pants, requirements for a successful elegance. Fall Winter 2015-2016 accessories trends, come to us full of character and attitude, due to the versatility and functionality that these items pieces provide, always being indispensable and desired by us women. Fall Winter 2015-2016 haircut trends are full of volume and natural movement, giving an intense and free wavy to hair. The challenge is to find a dynamic style, that remains between femininity and rock spirit – there is nothing more timeless than a look effortless cool look. 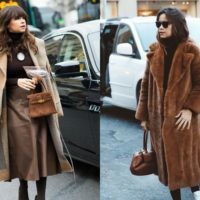 Find out the ways to wear boots in Fall Winter 2018, from ankle to thigh, from the most discrete to the most exuberant, at all times, at any hour of the day and in the most varied occasions.